Nofiate : Each capsule contains Fenofibrate BP (micronised) 200 mg.
Fenofibrate (Nofiate) is a fibric acid derivative. Fenofibrate (Nofiate) is rapidly hydrolyzed after oral ingestion to its pharmacologically active form, fenofibric acid. Fenofibric acid produces reductions in total cholesterol, LDL cholesterol, Apo-lipoprotein B, Total triglycerides and VLDL. In addition, treatment with Fenofibrate results in increases in HDL and apo-proteins apoAI apoAII. Fenofibrate also reduces serum uric acid levels in hyperuricemic and normal individuals by increasing the urinary excretion of uric acid. The micronised form of Nofiate(Fenofibrate) has enhanced absorption over the non-micronised formulation. Nofiate (Fenofibrate) is indicated for hyperlipidemias of type IIa, IIb, III, IV & V in patients who have not responded adequately to diet & other appropriate measures. 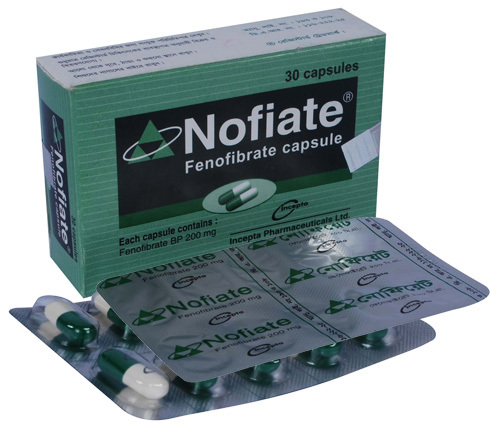 Nofiate (Fenofibrate) capsule 200 mg once daily is recommended as the dose for the treatment of primary hypercholesterolemia, hypertriglyceridemia or mixed hyperlipidemia. Absorption of Nofiate is increased by approximately 35% when administered with food. Gastro-intestinal (e.g. nausea, anorexia, gastric pain), pruritus, urticaria, impotence, also headache, dizziness, vertigo, fatigue, hair loss; myotoxicity. Special care needed in patients with renal disease, as progressive increases in serum creatinine concentration or failure to follow dosage guidelines may result in myotoxicity; discontinue if myotoxicity suspected or creatinine kinase concen-tration increases significantly. Liver function tests recommended every 3 months for first year. Fenofibrate is not recommended for pregnant women.